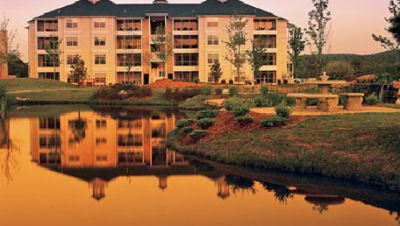 The Suites at Fall Creek in Branson, Missouri - Bid Per 7 Night Stay in a Studio Unit! Enjoy 7 Nights at The Suites at Fall Creek in Branson, Missouri! The Suites at Fall Creek are strategically located on a lake with the gorgeous Ozark Mountains as a back drop. Very close to Branson itself, the resort is near the Lawrence Welk Champaign Theater and Sheppard of the Hills Fish Hatchery. Other famous venues are minutes away. The resort itself offers prime touches and activities, such as both indoor and outdoor pools, a spa tub, a full fitness center and more. Play tennis, let the kids hang out in the children’s pool or shop in the gift shops. Go trout fishing or water skiing at the many lakes nearby. It’s the perfect vacation base. All units are quaint, comfortable and modernly appointed at The Suites at Fall Creek. Ideal for families, each suite has plenty of room for everyone to spread out and relax. There are luxury touches like private screened-in porches and relaxing in-room fireplaces, as well as all the amenities you could want. There are large and comfy beds, whirlpool spas in the master bath, fully-equipped kitchens and everything is nicely climate controlled. Your STUDIO UNIT will accommodate up to 2 people. The unit has 1 queen bed and a partial kitchen. Resort charges an amenities fee of $8 per unit per day plus tax.